Chevrolet introduced their first postwar design in 1949 and continued that iteration until 1952. At that point, nearly every other domestic manufacturer had fully incorporated postwar themes such as slab sides and lower ride heights, while Chevrolet was more reserved. Their trepidation with completely new designs didn’t hurt sales, however, as the company was the most prolific producer during that timeframe. 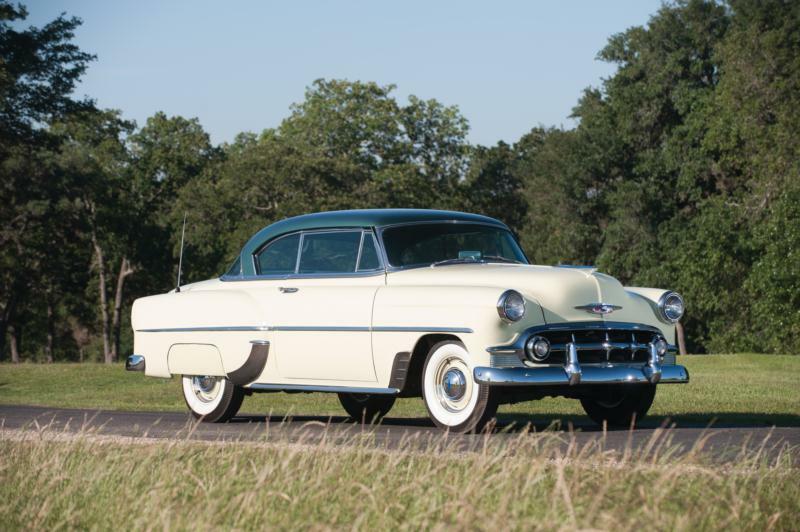 Even so, in order to draw even with Ford and Plymouth in the styling department, the 1953 Chevrolets were all new. Fender protrusions shrunk, as did heights. The 235-c.i. engine gained aluminum pistons and full-pressure lubrication, and became the sole displacement size available across the brand. Also, all new model names were introduced, with the 150, 210, and Bel Air. The 150 was the bare-bones model with little chrome trim and rubber mats, the 210 was the intermediate, with some brightwork and the Bel Air was fully trimmed, with two-tone interior and carpet. The windshield was curved and one-piece, the grille was bolder and oval, with turn signals in the corners, and the front fender line flowed through, with side trim and a contrasting roof and side-flash in the top-line Bel Air. The new models were significantly more attractive than their predecessors, with bright colors and superior trim, especially in the Bel Air. 1954 would be the last evolution of the 1949 body style, as 1955 would break the mold with a classically clean form and the new V-8. For 1954, the six-cylinder 235-c.i. engine continued, and new options included power brakes, power front windows, and a power front seat. The 1954 models are typically preferred among this generation, as there are better colors, more options, and increased refinement. Performance is subdued when compared to later Chevrolets, and engine swaps to a small-block V-8 are require the torque-tube driveline to be (expensively) replaced. Such profound re-engineering has kept a lot of cars of this era with their six-cylinders in-tact, but utility is correspondingly restricted to leisurely cruises. As such, Chevrolet values of this era remain quite affordable. *Please note: All prices shown here are based on various data sources, as detailed in About Our Prices. For all Hagerty Insurance clients: The values shown do not imply coverage in this amount. In the event of a claim, the guaranteed value(s) on your policy declarations page is the amount your vehicle(s) is covered for, even if the value displayed here is different. If you would like to discuss your Hagerty Insurance policy, please call us at 877-922-9701.